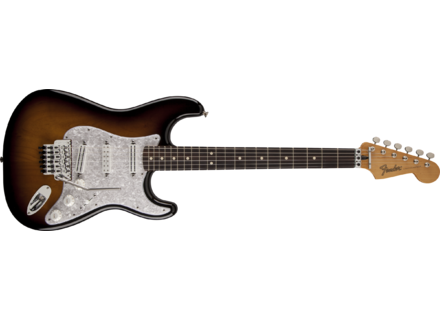 Dave Murray Stratocaster 2015, STC-Shaped Guitar from Fender in the Artist Stratocaster series. There are walls full of new guitars at the Fender booth at NAMM, and among them a new Dave Murray Stratocaster. This new California Series Stratocaster signature was designed in collaboration with Iron Maiden guitarist Dave Murray in person. [NAMM] The Saffron Squeeze is back NAMM 2015 visitors will find at the Dunlop booth a new version of the Saffron Squeeze compressor pedal by Way Huge. [NAMM] A Mini Cry Baby by Dunlop Don’t get fooled by the picture above, for this is a small Cry Baby wah wah pedal that Jim Dunlop introduces at NAMM 2015. [NAMM] Vox updates its AmPlug Cab The mini AmPlug Cab guitar cab will be updated to v2 this year, that’s what Vox announces this week at NAMM.